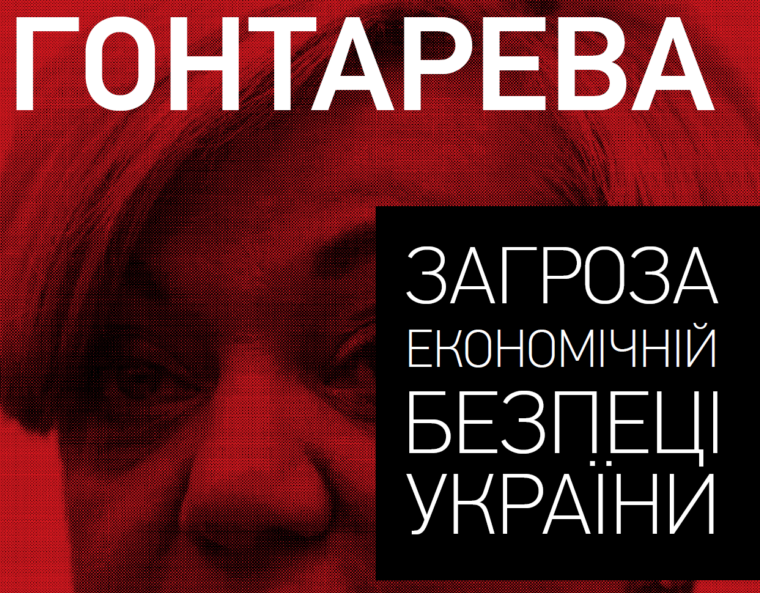 The pamphlet by the Ukrainian MP Serhiy Taruta “Hontareva. A Threat to the Economic Security of Ukraine” has split politicians and experts into two opposing camps, those who support Taruta and those who support Valeriya Hontareva, the Head of the National Bank of Ukraine. VoxCheck has checked most of the facts from the brochure and has discovered that the data, though mostly correct, are manipulated in almost all occasions. The next VoxCheck edition will focus on checking the arguments made by the opponents of Taruta, Valeriya Hontareva and her deputies. Taruta’s pamphlet, which contains many arguments against the NBU’s policy and Hontareva’s decisions, has prompted various experts and politicians to express their views on the regulator’s actions in the last two years. VoxCheck has checked the Ukrainian-language edition of the brochure (which differs slightly from the English-language original). We deliberately omitted the accusations of fraud and embezzlement, because it is specialized authorities, not fact-checkers, that have to investigate such claims. VoxCheck has focused on the economy-related and financial issues raised by Taruta. We have only considered those topics that we view as the most important. These include the exchange rate of hryvnia, the situation in the banking system and the economy overall, as well as the so-called “bank decline” in Ukraine. As it turned out, Taruta’s text includes quite a lot of accurate figures and facts. Yet all of them are used in a very manipulative way and thus help create the distorted perception of the real economic situation in Ukraine. 1.“Inefficiency and incompetence. 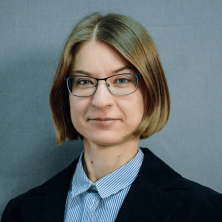 Valeriya Hontareva is responsible for the NBU’s failure to carry out its basic functions and to secure the stability of the national monetary unit”. Manipulation. 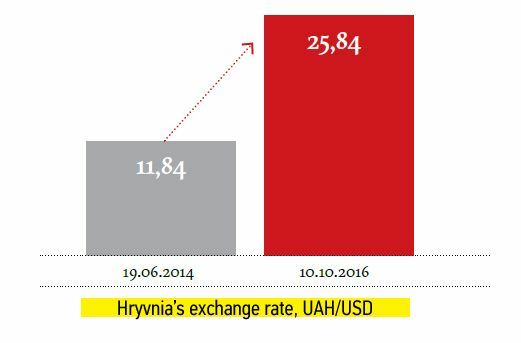 Politicians and experts often define the stability of hryvnia as the main objective of the NBU when speaking about hryvnia’s devaluation. In the brochure, Taruta himself defines the “instability” as the fall in the value of hryvnia relative to other currencies. He also spoke about this live on 3S.TV channel on October 17: “What are the responsibilities of the National Bank? First, it is responsible for the stability of the national currency. Everyone knows what the exchange rate was when Hontareva became the Head of the Bank. And what is the current exchange rate? Yet the stability of the national currency is not equivalent to keeping its exchange rate pegged to the US dollar. “The monetary unit of Ukraine is the hryvnia. To ensure the stability of the monetary unit is the major function of the central bank of the State – the National Bank of Ukraine”. Ukraine’s Law on the National Bank of Ukraine (article 6) explains it in more detail, “According to the Constitution of Ukraine, the main function of the NBU is to ensure stability of the monetary unit of Ukraine. When exercising its main function the NBU shall proceed from the priority of achievement and retention of the price stability in the country”. Article 1 of the Law explains that “price stability” denotes “retention of the purchasing power of the national currency by means of keeping in a middle-term (from 3 to 5 years) low and stable rates of inflation measured with the consumer price index”. Therefore, neither the Constitution not the Law on the NBU speak about the need to maintain the currency peg (to keep the hryvnia’s exchange rate fixed). It was only at the beginning of 2015 that the NBU’s management broke the vicious circle “crisis – devaluation of hryvnia – fixing the rate at a lower level – crisis”. The Central Bank has started to implement the inflation targeting regime, which means it defined the price stability as its priority, as prescribed by the law. Therefore, keeping the exchange rate fixed is not the NBU’s task. The drastic devaluation in 2014-2015 was caused primarily by an incredible shock, an armed conflict that led to the loss of a large part of Ukraine’s production and exports. Yet the next comment in this article treats the reasons for hryvnia’s devaluation more extensively. 2. “The drop in the value of hryvnia. In the last 2 years, hryvnia has devaluated by 2.18 times. On June 19, 2016 Valeriya Hontareva was appointed the head of the NBU”. Manipulation. The data on the hryvnia’s exchange rate to the US dollar are correct. Yet the brochure contains no mention of the main economic reasons for hryvnia’s devaluation that cannot be controlled by the NBU, e. g.
an armed conflict in the East of Ukraine, which led to the collapse of industrial output, the loss of part of exports, the outflow of capital from the country and panic among the population. The worldwide slump of prices of key Ukrainian exports positions: metals, grain, fertilizers etc. Even if the volume of exports stays constant (it actually decreased as well), the decrease in prices leads to a drop in foreign currency proceeds. Low foreign exchange reserves, which had to be spent on large interest payments and gas imports, limited the ability of the NBU to oppose the devaluation pressure on hryvnia and fueled the panic. In June 2014, the reserves amounted to $17.1. After settling external debt of Naftogaz and the Bank’s attempt to keep the hryvnia’s exchange rate constant, they fell to meager $5.6 bn in February 2015. It should be stressed that any comparison of the exchange rates at two different dates does not make any sense if no explanation of economic factors is provided (especially since these factors are not always controlled by the central bank). Such a comparison is thus always manipulative. “The consumer inflation is rampant. 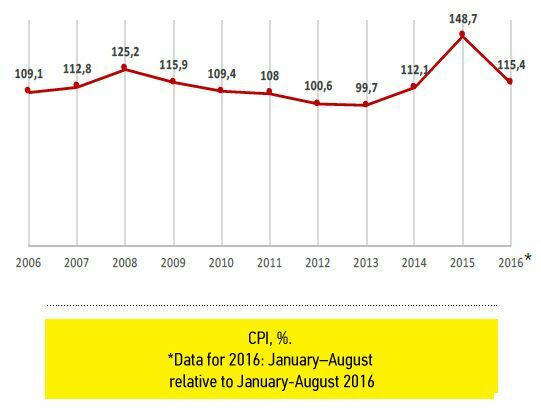 The CPI in 2015 amounted to 148.7% relative to 2014”. Manipulation. Correct numbers are once again used manipulatively. Indeed, the CPI was equal to 148.7 in 2015 (without the % sign because CPI is an index). However, this means that inflation amounted to 48.7%, not 148.7%. Moreover, the term “rampant inflation” is used only if the price growth cannot be controlled in cases of hyperinflation, such as in in 1990s. 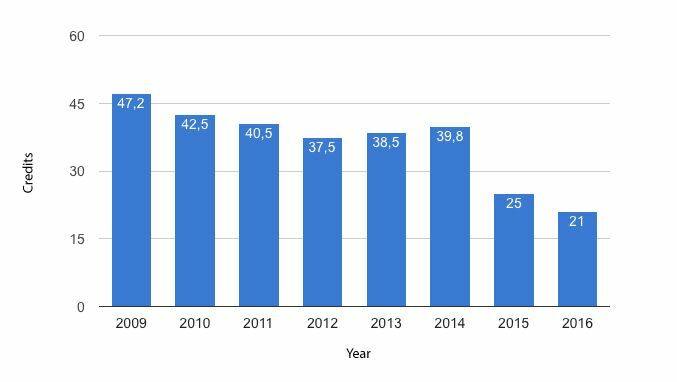 The graph shows that inflation in Ukraine started falling in 2016. Hence, it is not correct to argue that “the inflation is rampant” (as the brochure does), since according to the latest data, annual inflation is currently below 10%. Manipulation. The $183 number is in fact the 2013 GDP value, not the 2014 one. In 2014, according to the IMF, GDP amounted to $132 bn. It is also difficult to understand how the authors obtained the $79 bn figure for 2016. If the GDP in the last 4 quarters (the 3rd and 4th quarters of 2015 and the 1st and 2nd quarters of 2016) is taken, it amounts to 2131 UAH bn or $85 bn (at 25 UAH/USD rate). 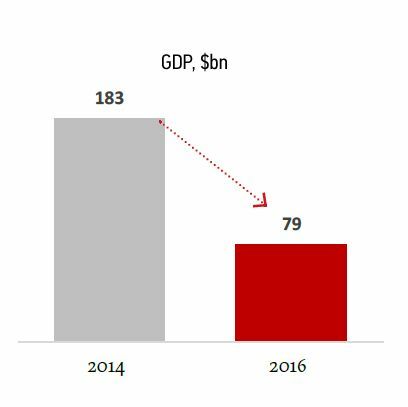 However, the correct way would be to use the predicted value of the GDP in 2016, which equals 2281 bn UAH or $87 bn (prediction by the IMF). In any case, the NBU can hardly be made responsible for the drop in the GDP. Manipulation. 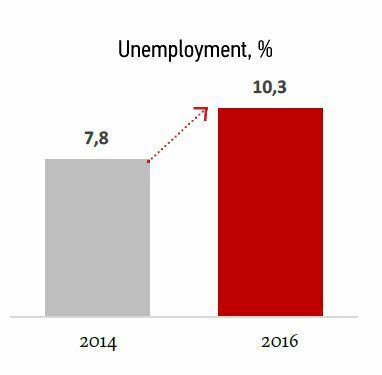 At first glance, the numbers are correct; however, the unemployment was equal to 10.3% in the 1st quarter of 2016, while 7.8% relates to the whole 2013 (not to 2014, according to the State Statistics Committee). In 2014, the unemployment was 9.7%. As unemployment fluctuates seasonally (usually falls in summer due to increased employment in agriculture), it is necessary to compare either the 1st quarters of 2014 and 2016 or the annual data. As in the GDP decline case, the rise in unemployment is caused by many factors outside the influence of the central bank. Manipulation. The data are taken from the State Statistical Committee and are correct (the only thing is that 343,000 was the number of enterprises in 2015, and not in 2016). 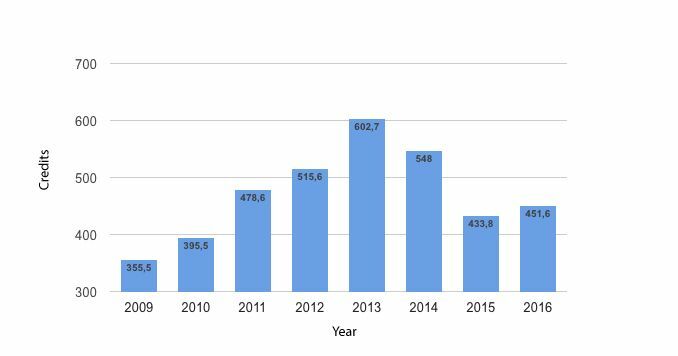 Yet according to the very same data, the number of private entrepreneurs rose from 1.3 mln to 1.6 mln in 2015. For unknown reasons, the brochure does not mention this fact. At the same time, according to the estimations by the National Academy of Science in Ukraine, at least 40,000 small and medium enterprises stopped working. 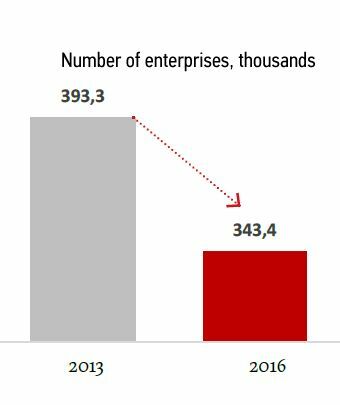 Therefore, the decrease in the number of enterprises in Ukraine since 2013 is largely explained by the conflict in the east of the country. The manipulation occurs not only in the context, but in the way the data are presented as well. The visual difference between the size of the columns is larger than the real drop in the number of enterprises. To sum up, even if we do not take into account the manipulative character of the presented data, it is necessary to understand that the NBU is not the only or the most important authority charged with controlling the indicators above. 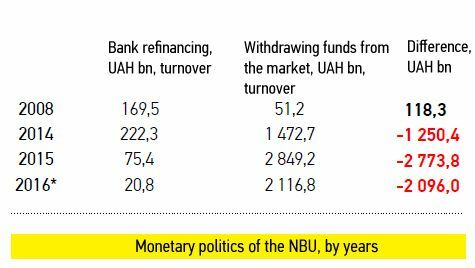 Moreover, these graphs illustrate the difficulties with which the NBU had to cope while carrying out its policy. 7. “The loss of trust of depositors. 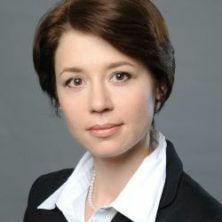 Valeriya Hontareva has dealt a blow to the central bank’s reputation. This led to a substantial outflow of funds from the banking system. In 2014-2016, Ukrainian citizens withdrew more than 30% of foreign currency deposits. The volume of deposits fell to the 2014 level”. Manipulation. Indeed, in June 2014, foreign currency deposits in banks amounted to $23.3 bn (according to the NBU), while in August 2016 they amounted to about $14 bn. The numbers in the brochure are thus almost correct. However, it is not correct to blame Hontareva for the outflow of foreign currency deposits. The outflow started before she was appointed (in June 2014) and was caused by such factors as the war and economic recession. 8.“The bank solvency crisis. The NBU’s monetary policy after the appointment of Valeriya Hontareva led to the liquidity crisis in the banking system, which grew into the solvency crisis due to insufficient refinancing”. Manipulation. According to our calculations, some of these indicators match the official data, yet others don’t (the data can be found here). However, it is important to understand that this approach to comparing data is wrong. In order to understand whether the NBU gave more to banks than took from them, it is necessary to compare the cash balances on a certain date, and not the total turnover. After all, it is possible to reach the 2 bn UAH of turnover in very different ways. The first option would be, e.g. to issue a small refinancing loan (5.5 mln UAH) every day. The annual turnover would then be almost 2 bn UAH = 5.5 mln*360. If the same loan were issued once in two quarters, the annual turnover would be mere 11 mln, while the balance at the end of the year would be the same (5.5 mln). Moreover, in this case, “the withdrawal of funds” is actually used to refer to the purchase of NBU deposit certificates by banks. No one forces banks to buy these securities. They do this voluntarily, when they have some surplus money. Therefore, the data in the table do not tell us anything about the rigidity of the NBU’s monetary policy or about the sufficiency of refinancing. 9. “Affordable loans are the key resource for the growth of economy. However, the NBU closes the access of the business to loan funds. As of today, banks have almost stopped providing loans to the country’s economy. In 2014-August 2016, the drop in the volume of loans in hryvnias equaled 25%. Issuing loans in foreign currency has also stalled”. in foreign currency: from $40 bn to $21 bn (about 50%). However, this is not the complete picture. Rather than being the outcome of the NBU’s policies, the lack of loans is caused by macroeconomic risks, namely the war and the loss of territory (which led to the loss of many clients and credit operations), as well as the economic slump, high indebtedness of companies and weak protection of the rights of creditors. 10.“The NBU encourages the banks to use the deposit certificates of the NBU and government bonds, thus withdrawing money from the economy. 158.4 bn UAH were withdrawn with the use of government bonds by commercial banks”. Manipulation. The numbers are almost correct. 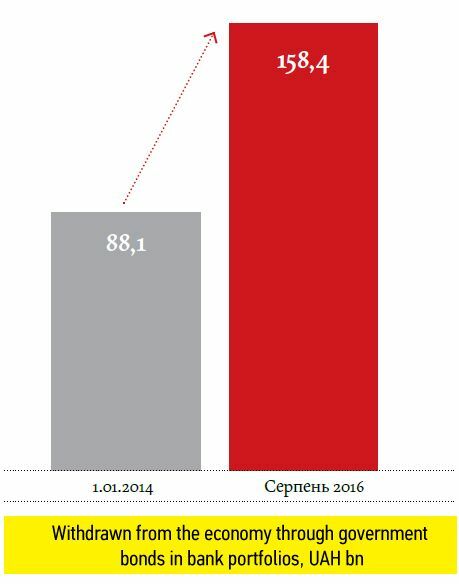 According to the NBU, as of 03.01.14, banks kept 81 bn worth of government bonds, while, as of 31.08.16, they kept 147.1 bn UAH. Therefore, the value of government bonds in bank portfolios grew by 66 bn UAH in this period. However, it is not true that these funds were withdrawn from the economy. The increase in value of the government bonds that are being held by banks may have resulted from various operations with government bonds. For instance, banks buy government bonds from the Ministry of Finance on the primary market and transfer free funds into the economy through the state budget. The so-called recapitalization is another example. The government increases the capital of state-owned banks through issuing government bonds, which are then held by banks. Since the beginning of 2014, the government has issued 30.4 bn of government bonds for recapitalization, which accounts almost for half of the growth of government bonds that have been kept by the banks in this period. The only case when funds are indeed withdrawn from the economy is when the NBU sells government bonds from its portfolio. This is a classic instrument of tightening the money supply in order to curtail inflation (VoxUkraine has written about the danger of inflating the economy with superfluous money in more detail). These operations are not obligatory. They are only carried out if there is a surplus liquidity in the banking system and banks are interested in temporarily depositing their surplus funds in exchange for interest payments. 11. “Facilitating the expansion of the Russian state-controlled funds in the banking system of Ukraine. Against the backdrop of the massive collapse of Ukrainian banks, Russian banks have been increasing their foothold in Ukraine. As of the beginning of July 2016, 4 of 37 largest banks were fully controlled by the Russian capital. Moreover, 3 banks were mostly owned by the Russian state-controlled capital. The total share of Russian banks on the Ukrainian market equals 40.7% (measured as the share of the statutory capital)”. Manipulation. The numbers used in these arguments are correct. Indeed, the share of the four largest Russian banks in the statutory capital of Ukrainian banks amounts to about 40% (to be precise, to 36.15%, if the capital of insolvent banks is not taken into account). However, this indicator does not reveal anything about the share of Russian banks in the Ukrainian market. The market share of a company is measured by the amount of services and goods it sells in a given market. For banks, the share is measured by the amount of assets (mainly by the issued loans). The assets of the largest banks with Russian capital (Sberbank, Prominvestbank, VTB, AlfaBank and BM Bank) amount to 12% of the total assets in the banking system of Ukraine (in August 2016). At the end of December 2014, the share of assets owned by these banks amounted to 13.3%. Therefore, the market share of Russian banks has actually decreased. 12. “The state has spent about 60 bn UAH on financing the Deposit Guarantee Fund”. True. In 2015, the Deposit Guarantee Fund received 41.5 bn UAH worth of loans from the Cabinet of Ministers (in the form of government bonds), as well as the 9.95 bn UAH loan from the NBU. In 2014, it received 10.2 bn from the NBU and 10.1 bn from the government. The total assistance amounted to 71.8 bn UAH. Given that the Fund repaid some loans early (about 10 bn UAH, the Fund raised about 60 bn UAH in total in 2014-2015. 13. “The population has lost 134 bn UAH of deposits in the banks that were liquidated in 2014-2016”. Lie. According to our calculations, the deposits in the banks that were removed from the market by the NBU in 2014-2016 amounted to (at the moment of proclaiming a bank insolvent) 117 bn UAH of deposits of individuals and 155 bn in total (including those of legal entities). 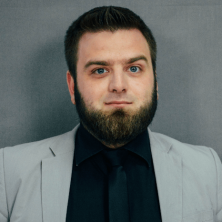 According to the data that VoxCheck received from the Deposit Guarantee Fund, in 2014-2016, the clients of insolvent banks have already been paid about 80 bn UAH. The payments are still ongoing. Therefore, the loss of deposits actually amounts to 117 bn UAH – 80 bn UAH = 37 bn UAH in cases when large depositors did not receive the compensation after the banks’ assets have been sold. “The NBU refused to organize the proceedings with assets and liabilities of insolvent banks”. Lie. Four years ago, on September 2012, the Law “On Households Deposit Guarantee System” came into force. This law expanded the functions of the Deposit Guarantee Fund, including its right to remove insolvent banks from the market by introducing provisional administration and liquidating insolvent banks. This means that the NBU does not have to deal with the assets and liabilities of bankrupt banks and does not control the Deposit Guarantee Fund. The Governing body of the Fund includes five managers. In addition to one member being the Fund’s director, one represents the Cabinet of Ministers of Ukraine, two represent the NBU, while another one represents the relevant parliament committee. The Fund is accountable to the Parliament, the Cabinet of Ministers of Ukraine, and the National Bank of Ukraine, but is not controlled by them.